Like many (I assume) my woodworking started as a tentative hobby. Something I’d always been interested in, but never made the time for. As I began experimenting and creating I realized that it is something that I truly love to do. However, like many (another assumption) I’ve bounced from project to project, learning or making things up as I went. This has worked fairly well so far, but I know that along the way I have skipped learning some fundamental skills. This morning I was sitting at the dining room table (one of my first real projects) drinking my coffee and reading The New Yankee Workshop by Norm Abram, trying to pick out a new project to tackle. I was toward the end of the book, reading about a blanket chest when I read ”...using the skills you developed building the first project in this book…” when I had a “duh!” moment. This blog series is a result of that “duh!” moment. 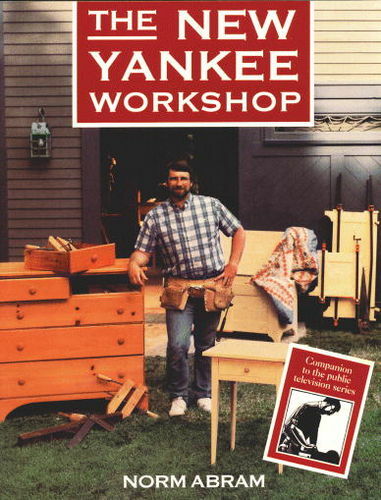 Over the next several months I will be methodically working through each project in The New Yankee Workshop book. I will start at the beginning of the book, and blog my progress as I move through each project. Hopefully, as I move through each project I’ll pick up new skills/techniques/jigs/and experience and maybe break some bad habits along the way. I’ll try my best to take photos and write about the steps I am taking in each project. I may also attempt some video blogging as well. I’m excited to “start over” and learn some new things that will hopefully allow me to tackle future projects with less frustration, and more success. I’m looking forward to hearing everyone’s thoughts on my projects, the approaches the book recommends, and any other thoughts my fellow ‘jocks have about my woodworking journey. Steve, I have added your blog to my RSS feeds so will be watching how it goes. I have seen Norm build all these projects so it will be interesting to watch someone else doing it. I like this idea! Very curious to see how you progress. I had never thought of taking a step back and cover the basics. I am going to watch your progress, maybe this is what I need to do. 10256 framing hammers…. not to mention the other multi-thousands of hammers he and Tommy Silva have picked up! LifeSaver2000- I appreciate it! I’ve never actually seen any Norm Abram – the book was a thrift store gift from my Mom when she found out I was into woodworking. I always thumb through it for ideas but had never thought to try and follow it as a guide. Dave T – Hopefully we all learn something from it. I’ve picked up a few things already working through the first project. Mistakes and new techniques already! Should be posting the first project this weekend. Dallas – Those definitely sound like bad habits! I already have an addictive personality and sometimes find myself thinking “I could totally do this easier if I had X, Y or Z new tool…” Maybe I’ll stick to the book and avoid actually ever watching any of Norm’s shows. It seems like you either like Norm and NYW or hate them. Personally, I like Norm and feel that he was a great ambassador to the world from woodworkers. JesseTutt – From what I’ve read/heard I like Norm and the NYW…experience has been limited but positive. The projects in this book are all based on the first season of the show. That was before Norm started to have a lot of the fancy tools. I recall he did mortises on the router table (which was a bench top model) and was using the wobble dado blade. No wide belt sander or even a hollow chisel mortiser. Don’t think there was a biscuit joiner either. He did like his nail gun though. The wobble dado….I have one of those…thought about using it for this blog series…put it on and fired it up…quickly decided I could wait to start until after I ran out to Midwest Woodworkers and picked up a dado stack. I’ve heard those things are hell on the arbor for table saws…and to be completely honest it kind of scared me too.